Flights diverted from Heathrow because of the fog...but NOT in Oakley. Some things doing quite well under the weeds, we have not had a frost yet so some suprising things still going strong. Warm today, at least 18 degrees C.
Planted garlic from The Garlic Farm, on the Isle of Wight. Those diverted aircraft could land here. Masses of tomatoes, the ripe ones have headed into the freezer and the green ones into a batch of green tomato chutney. Even more pleased to give away 9kg of the remaining green ones. There is a limit to how much chutney one can eat.. Rain at last but it is surprisingly dry underneath. 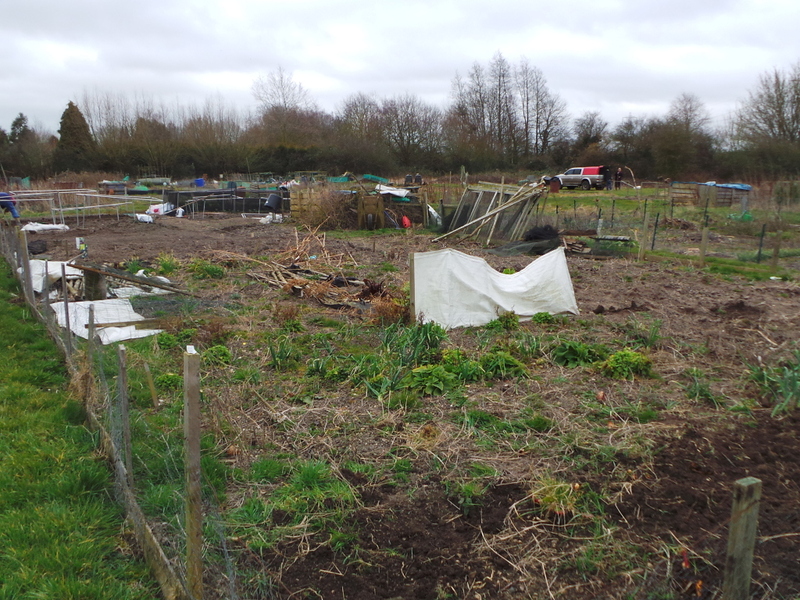 The weeds have liked it very much though, Have started the process of digging over the plot but too many other distractions to make much progress. Beans still producing and the winter squashes are coming on well after the rain. Tomatoes beginning to ripen. The onion crop drying and the runner beans. 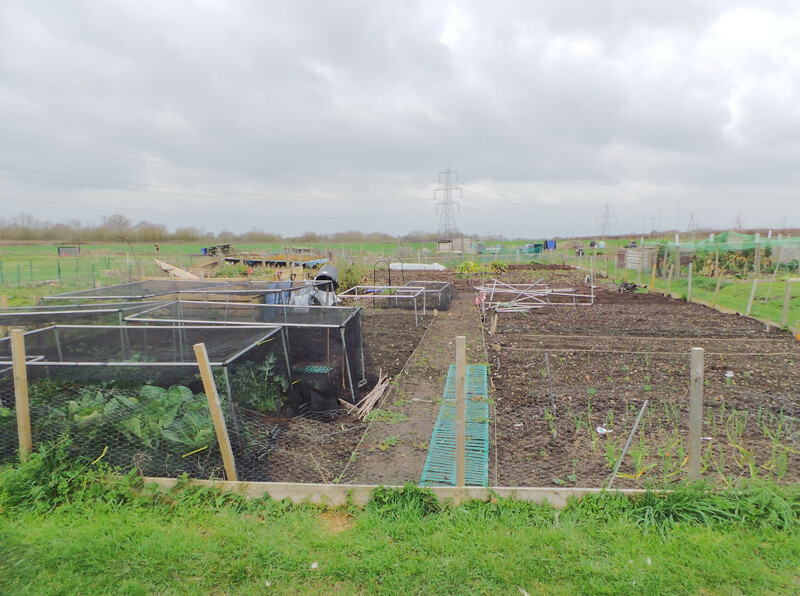 I have never know the allotment to be so dry, not even the weeds are growing and no sign of slugs, the usual bane of my life. Still its rained all night tonight so maybe they will soon all be in evidence again. Actually got out the bowser but it needs a bit of oil before I can drag it very far and very full. Sweet corn well over the 'knee high by 4th of July' mark. Everything very lush compared with the start of last month but lots of wind damage despite the windbreaks. I have some nice tomato plants at home which I have potted on into big pots, just need some warm calm weather before taking them up. The May blossom is out on the allotment and the weather forcast is for warm weather so everything is on the go, including the weeds of course. Planted up runner beans, more broad beans, sweet corn and a few beetroot. Still lots coming along in the cold frames at home. Very pleased to see that the garlic I put in last month is now doing well and seems to have caught up with Frank's autumn planting. [It's not as neat though] Considering that the box of garlic has bounced around unplanted in the back of my car since October this is especially pleasing. 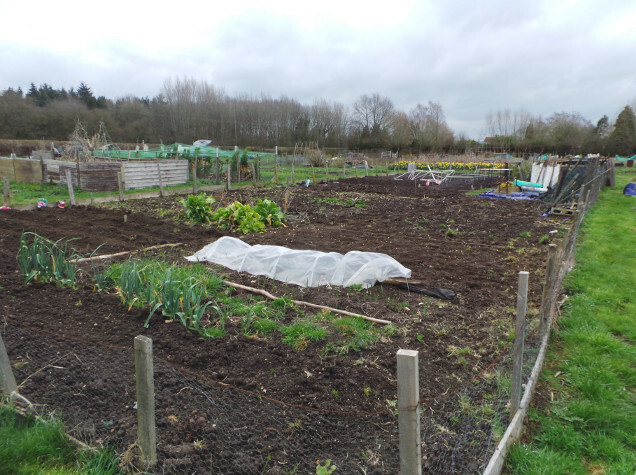 I have managed to rotovate most of my end now and even have deep dug over the potato patch. This made the platding of the potato sets particularly easy last week and again today. The gales in the last week have caused some mayhem around the whole site, my shed door was lying on the ground in front of the shed. When I picked it up the bottom was covered with slugs, this does not bode well as the slug season has hardly started yet. After a pretty non-descript winter, no snow, no gales, no floods. [Fact nothing to laugh at at all]. Things are beginning to liven up, including me, and the new year starts. The main innovation for this year is that Frank and I have decided to share the plot. His tidy and organised end is already putting me to shame as you will see from the pics below. However, we hope that there will be more prossibility of keeping on top of a smaller patch and that we won't produce the over abundance that we have in previous years.